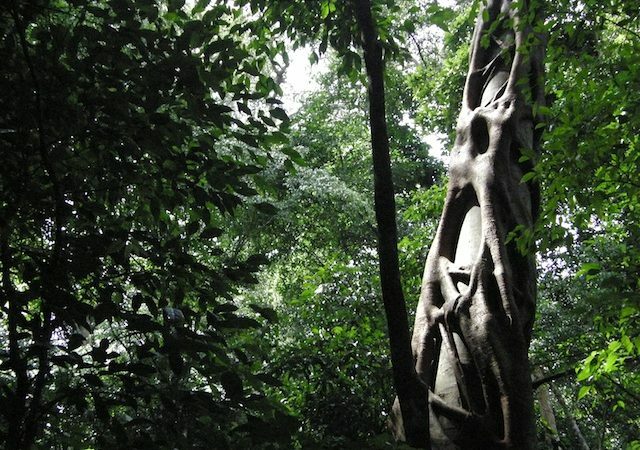 Kaniyo forest is a forest found just not very far from the Kichumbanyobo gate of Murchison falls national park. The Kaniyo pabidi forest is an ideal place to take a nature walk while at Murchison falls national park as tourists will come across a lot of wildlife especially primates like the white Columbus monkeys, black Columbus monkeys, red tailed monkey and olive baboons among others. Tourists can also go on a Chimpanzee trekking trip to this forest as well as birding. Forest birds found here are; ituri batis, yellow footed flycatcher, puvels illadopsis, chocolate backed kingfisher white thighed hornbill among the rest with a lot of plant species. Kaniyo pabidi forest is covered by mainly mahogany trees and iron wooden trees tourists can come with packed lunches and enjoy a picnic here, the best time for chimpanzee trekking is in October to January.